Jan's Writing Journal: " It Takes One To Know One..."
" It Takes One To Know One..."
Playwright John Godber once said: "On a good night ( at the theatre) you want laughter and tears at the same time. And that piece of art has to have guts"
And yesterday we got it. Guts and all. Within minutes of settling in our seats at Chester Theatre Club, we knew the score. Immediately, we were part of the family on stage because we'd met them all before. If they weren't within our own precious families, we'd seen them in other folks' precious families. And watching this fabulous play (John Godber's " Happy Families" skilfully directed by Lisa Miller) we recognised the delights, tensions, the laughter, the tiny tragedies, the looming ones. AND SO: we grinned at Dad's jokes ( superbly played by Tony O'Byrne)... because we'd heard this corn before. We grinned because we'd known Dads who became Tommy Cooper (at drop of fez ) at every family gathering for 30 years. And we sighed at a Grandad who bullied, then cowered before his wife, a man who could never express his husbandly love; a man who pinpointed a certain generation. Then we cringed at Mum's habits ( Helen Williams, smotheringly right) because we'd known women addicted to the cleanliness of curtains, triple mirrored dressing tables, the perfect shade of carpet )... be it women in council flats or ladies-who-lunch. We'd known grans in pearls, grans in slippers (Delys Rostron, previously on stage in furs).....but we'd all known grans loyal to family no matter what. We recognised a snooty sister who'd "bettered" herself, be it to Henley on Thames or semi in Crewe. We saw a sister who spent more time with parents than husband. And that seductive little girl next door....who hasn't met a pain like her?! Thankyou, Lisa and Little Theatre, for one of the best productions yet. You captured it all. 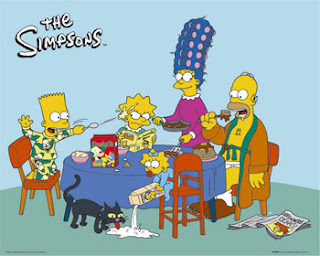 PS:Pictured above: The Simpsons, a family who also Share All This. PPS: John Godber is 3rd most performed playwright in UK after Shakespeare and Ayckbourn. I have been greatly enjoying, and highly envious of, your literary gallivantings! Sounds great! I've been so busy with my own horrors and work I haven't been able to get to Chester! Beautifully described, Jan. I wish I had been there too. What a rich cultural life you have. It sounds wonderful. My husband works in theatre so it's always good to hear what has been a success. Wish they were because that, Lucy, is such a lovely word! And as you're in Brittany, what's that in French?! Shame on you, bit I might forgive you. Ive seen on your blog just how very busy you are. Dont get the wrong impression, Marianne! I love a good slob in front of the TV with a bar of Cadburys and like buses ( didnt Wendy Cope write the poem?) "cultural stuff" often comes along all at once. Interested to know what he does in the theatre and what type of theatre it is? "The Colourful Life Of A 21st Century Poet"
"Making Music At The Bank Of America"
" Standing Solemnly in Stockport..."
"Tracy B Terrifies Tom L at Traddock Hotel"
"Lionel, Louis, Julian and Jane...."
"An Ode For An Odeon"
"Just In Case Leanne Is Peeping..."